Friday was a fantastic day of diving since I got to visit some new dive sites and got to photograph the capture of two Lionfish. We started out the day with Captain Bill leading a small group of us on two drift dives at Molasses Deep. We hit 52 feet on the first dive and 48 on the second. There was not much hard coral at that depth, but there was lots of Barrel Sponges and soft coral. 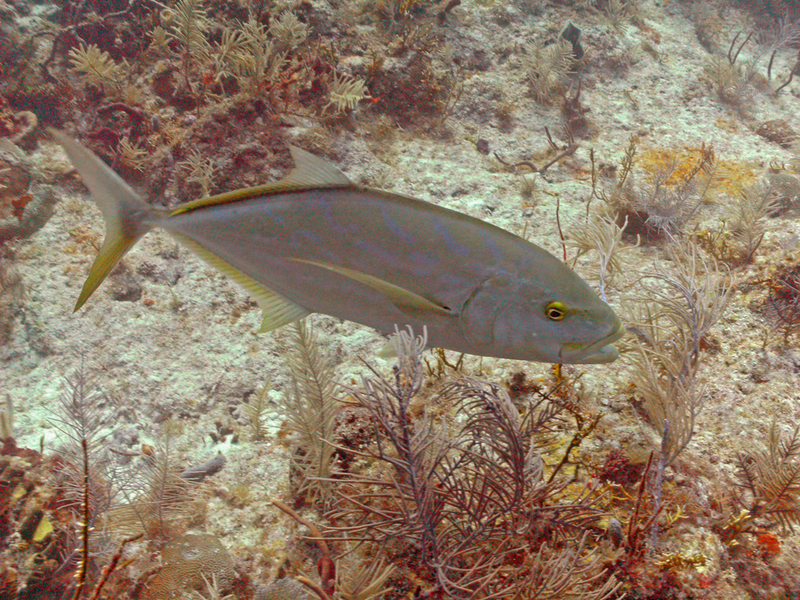 The second dive was especially memorable since I found a fish that I did not know the species. 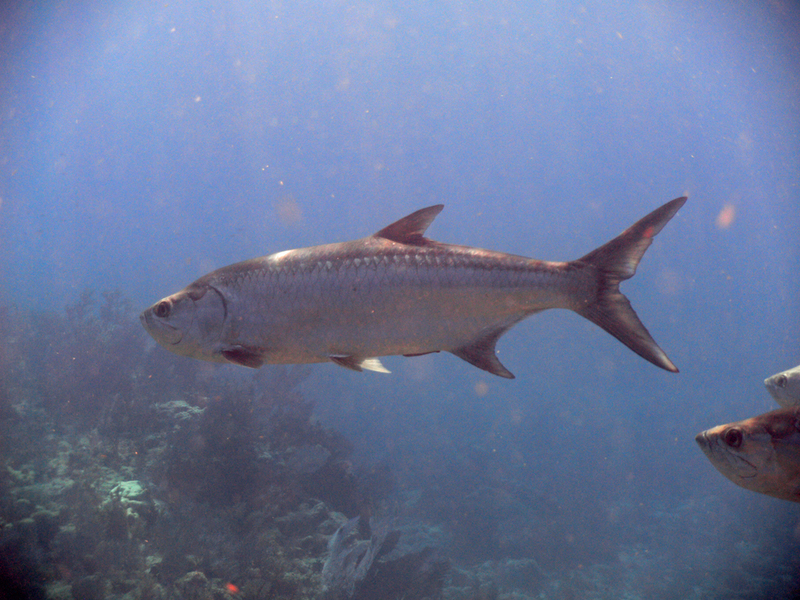 Using the photograph I was able to do some research and found out it was an Amber Jack. 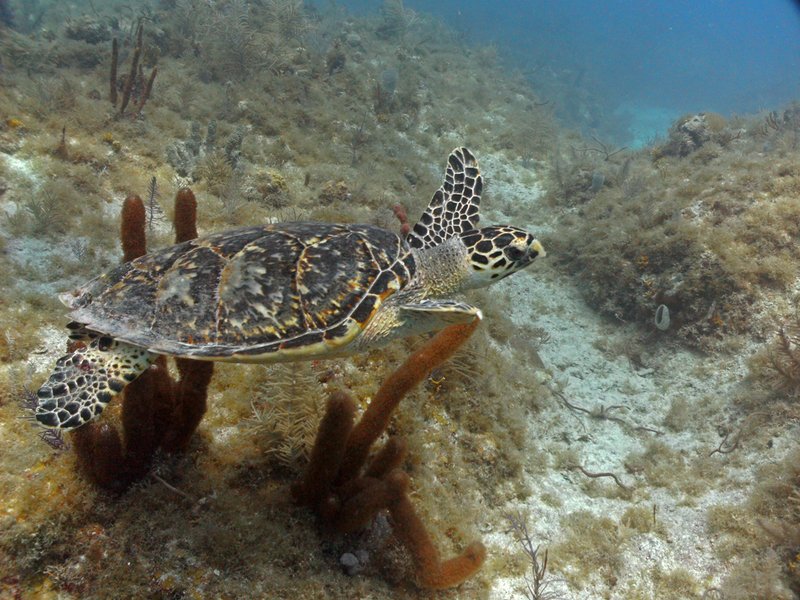 The afternoon dive was another deep drift dive at a site near Conch Reef called Conch Wall. It is near the NOAA Aquarius Underwater Research Station, which is a restricted area. 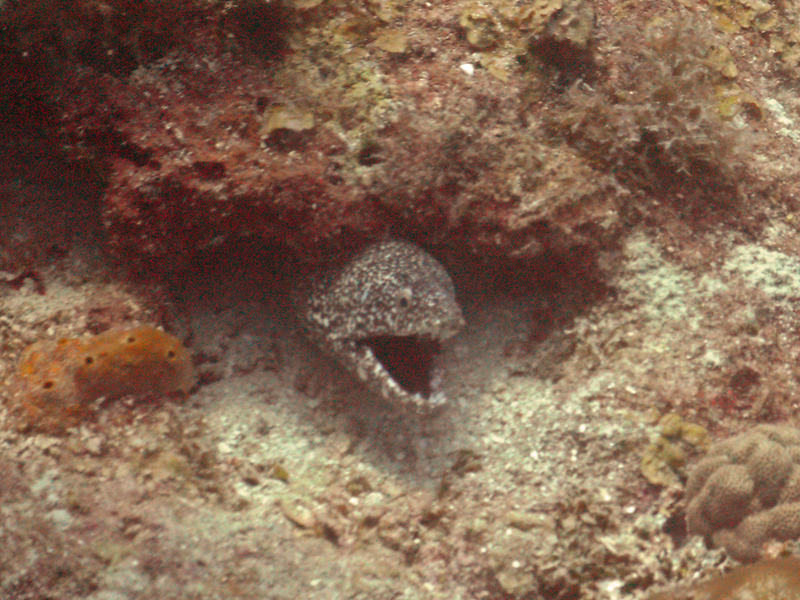 We hit 72 feet and saw a Spotted Morey Eel, a Green Morey Eel and two large Nurse Sharks. We stayed a bit shallower for the last dive since were were getting loaded up with nitrogen and did a drift dive and lionfish hunt near Snapper Ridge. 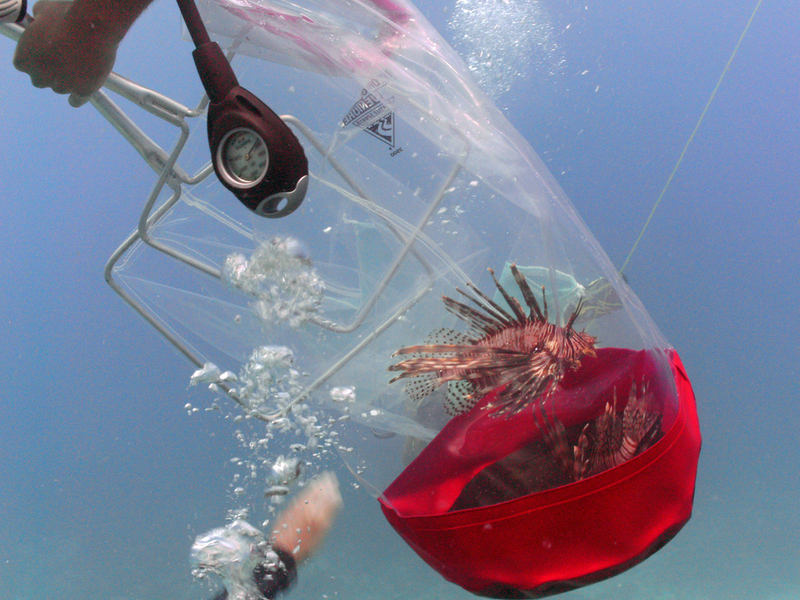 For those that don’t know, Lionfish are an invasive species that are interfering with the natural food web of the native species in the Florida Keys. 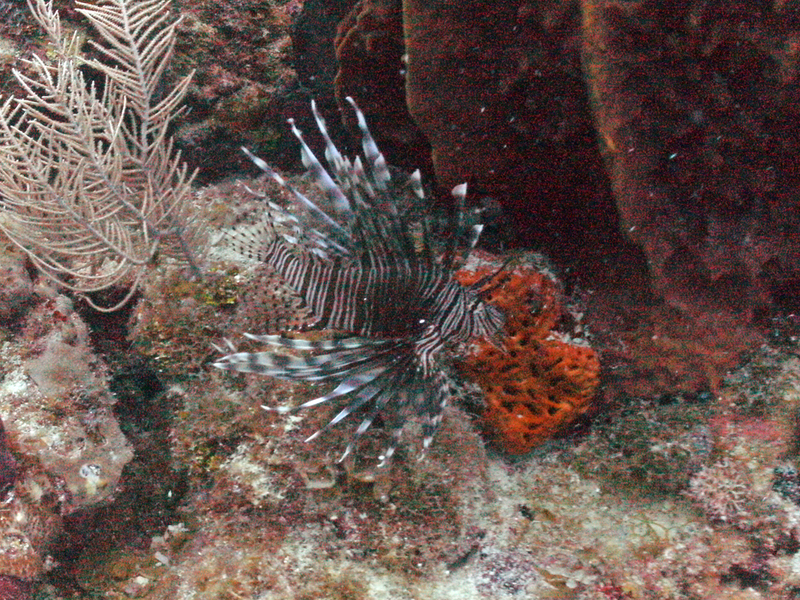 Check out the Reef.org Web page at http://www.reef.org/programs/exotic/lionfish for more information. 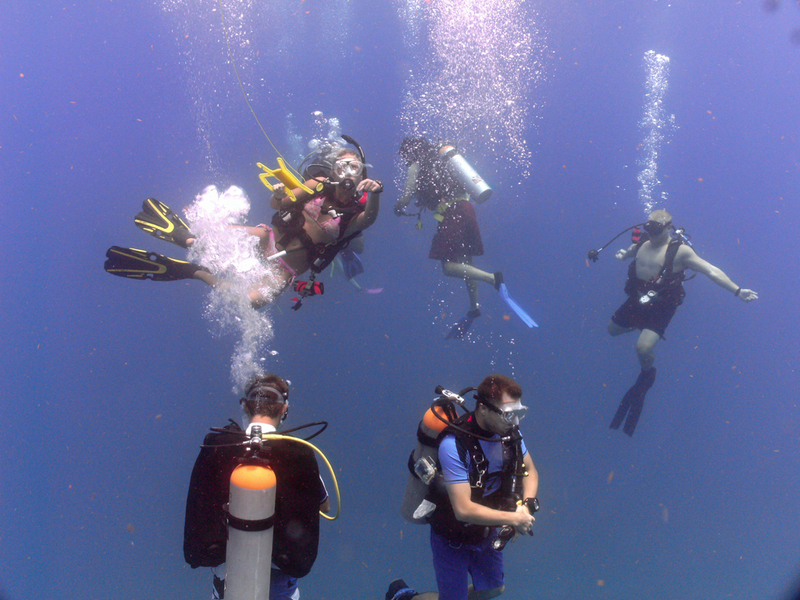 Rainbow Reef dive guides have been specially trained to safely remove them from the reefs in an attempt to control the damage done by these fish. 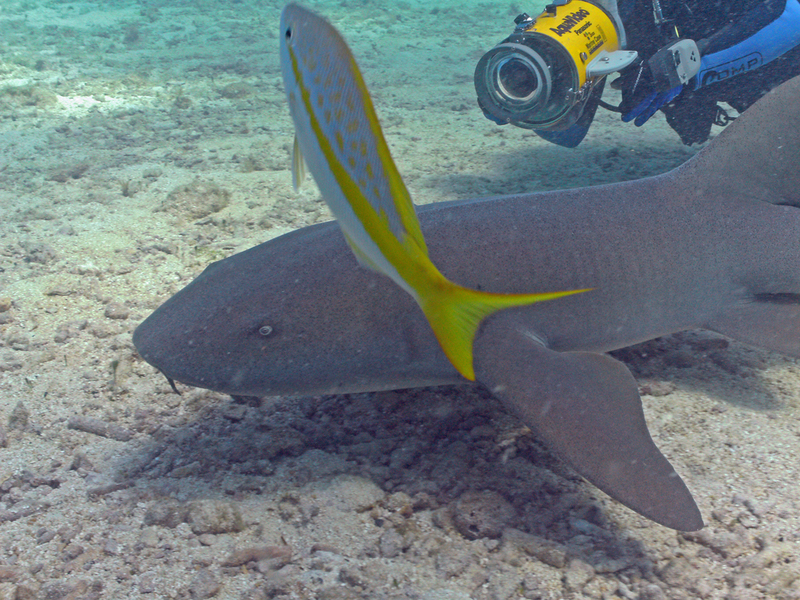 We discovered two of them, which dive guide Mike easily captured. They were brought back to the boat so the Rainbow Reef dive team could turn them into the NOAA scientist for study. 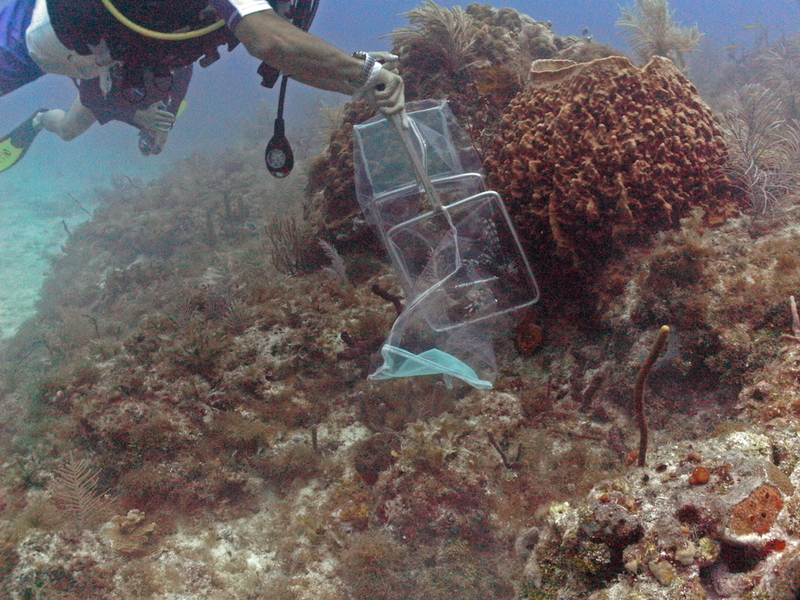 I was excited to be able to document the capture of two of this invasive species that is doing so much damage to the native Caribbean ecosystem. The morning dive on French Reef and the Benwood was relaxing but I had no major sea life sightings. The section of French Reef (Ball number 7) was a disappointment because just about all of the hard coral was dead, leaving only the soft coral. It is very sad and a look at the future if the current bleaching and disease trend keeps up. The Benwood dive was better since we did something a little different and followed the ridge near the bow and went to an area called the Chimney. We were hoping to see the Dolphins we spotted from the boat as we approached the wreck site. No luck but it was good to see a new area. The big surprise of the afternoon was to discover that Al and his son Evan was on the boat with me. 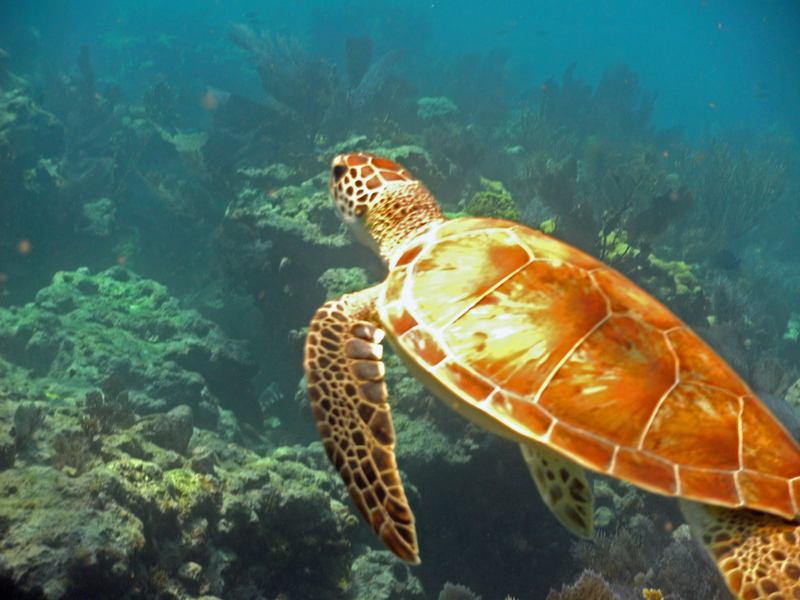 I had originally met them back in December of 2005 during my first trip to Key Largo and Rainbow Reef.What are the odds? The dive was led by Jardin and included Al, Evan and my dive buddy Jeff from Philadelphia. 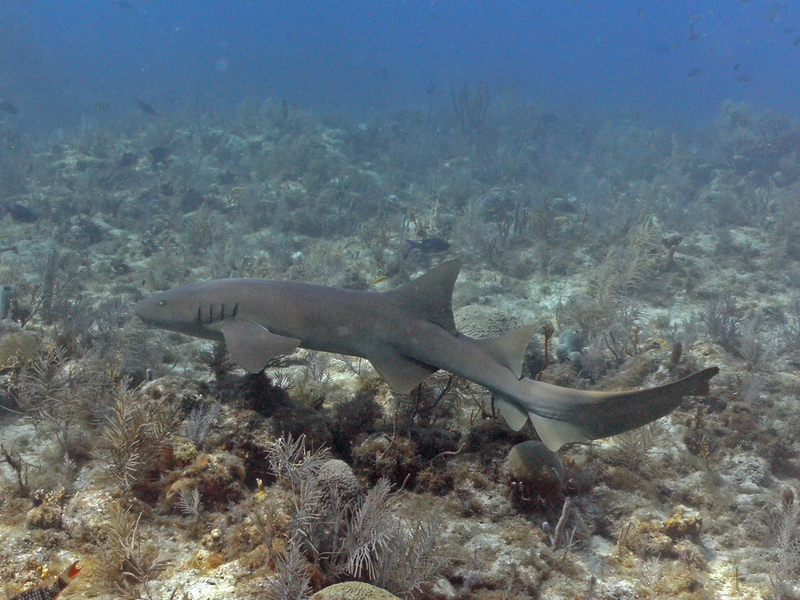 It was a fantastic afternoon dive on Molasses Reef with multiple major sea life sightings including a small turtle, a good sized grouper, an Eagle Ray and a Nurse Shark. There was little current and great visibility. Great Wednesday morning dive on the City of Washington wreck. Right when we jumped in there was a nurse shark and Goliath grouper circling under the boat and enjoying all the attention from the divers. I would not have believed it had I not seen it with my own eyes. 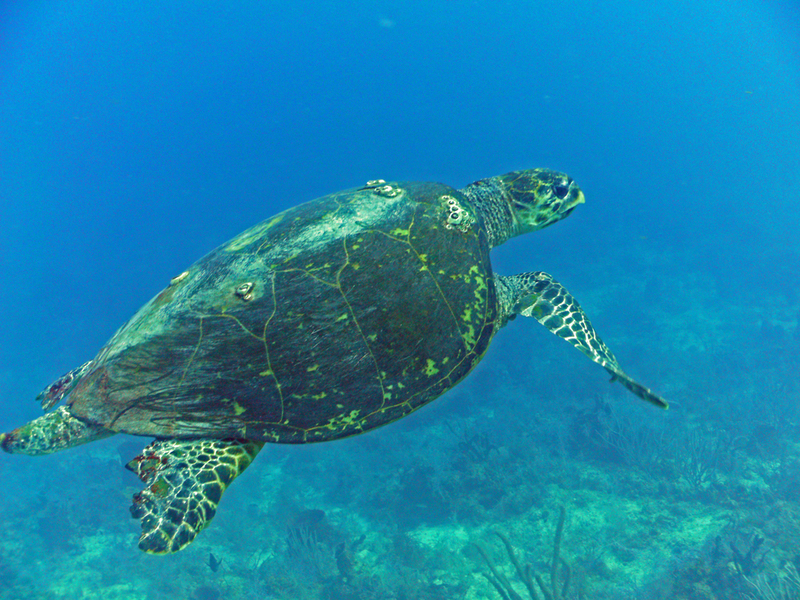 We spotted this huge turtle while diving Molasses Deep on Wednesday afternoon. Many thanks to Brad From Rainbow Reef for guiding us out there! Spent much of the day Tuesday on French Reef. We did an awesome drift dive this morning. 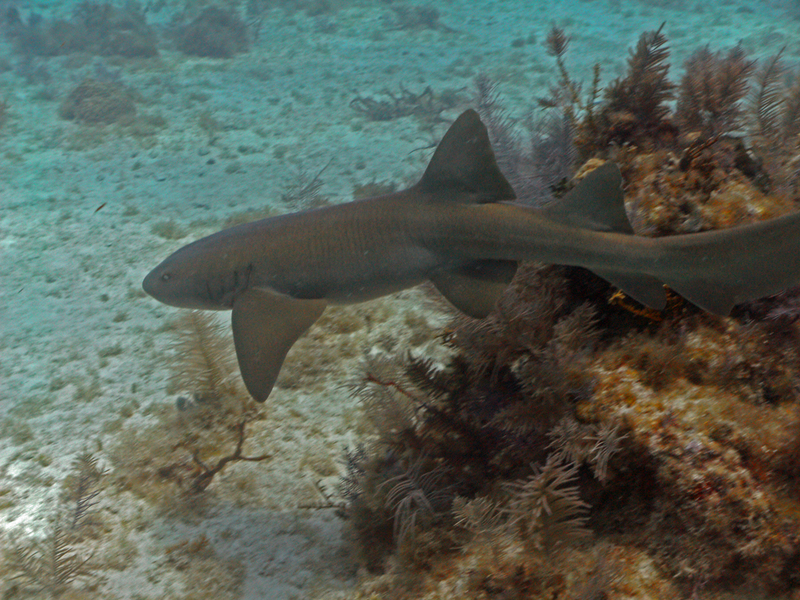 We had a close encounter with a Nurse Shark and spotted a Reef Shark in the distance. 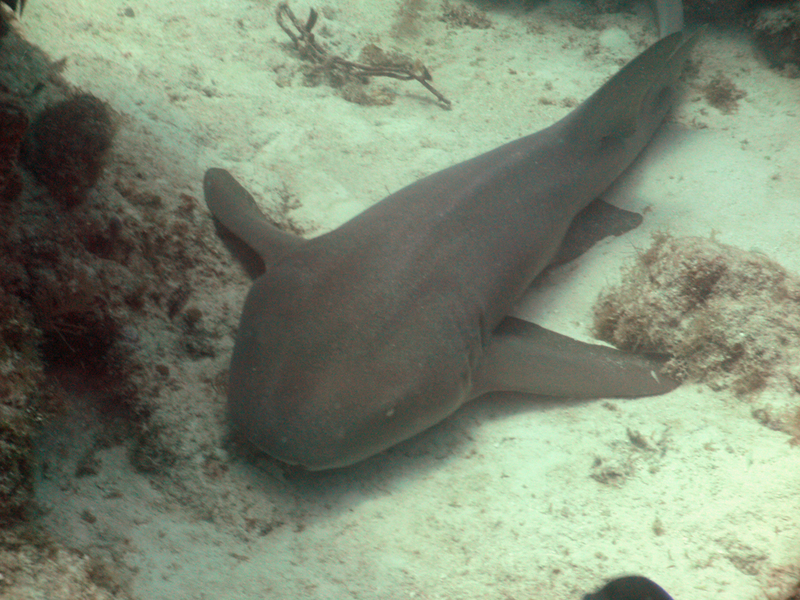 During the afternoon dive we spotted another Nurse Shark and got some great shots of a turtle. Many thanks to our fantastic dive guides! The visibility on Monday was great and there was barely any current. 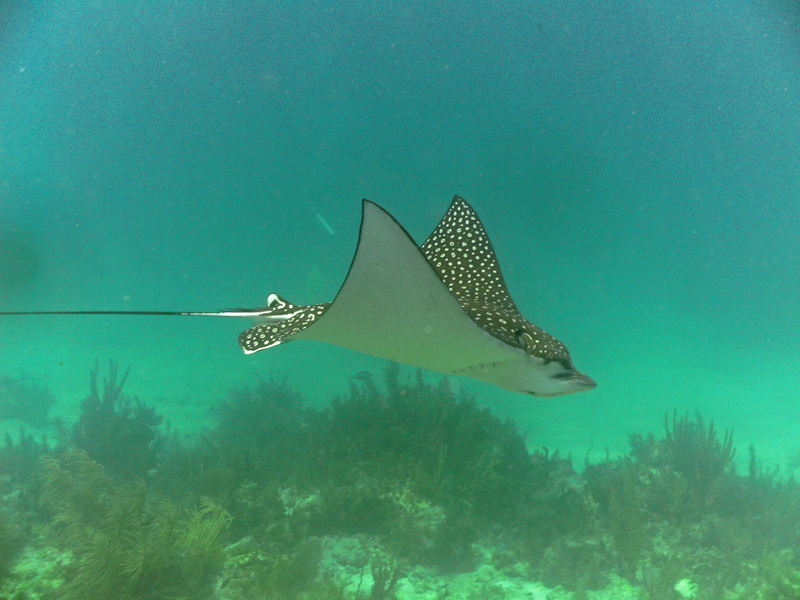 We saw one Eagle Ray and one Nurse Shark in the distance. 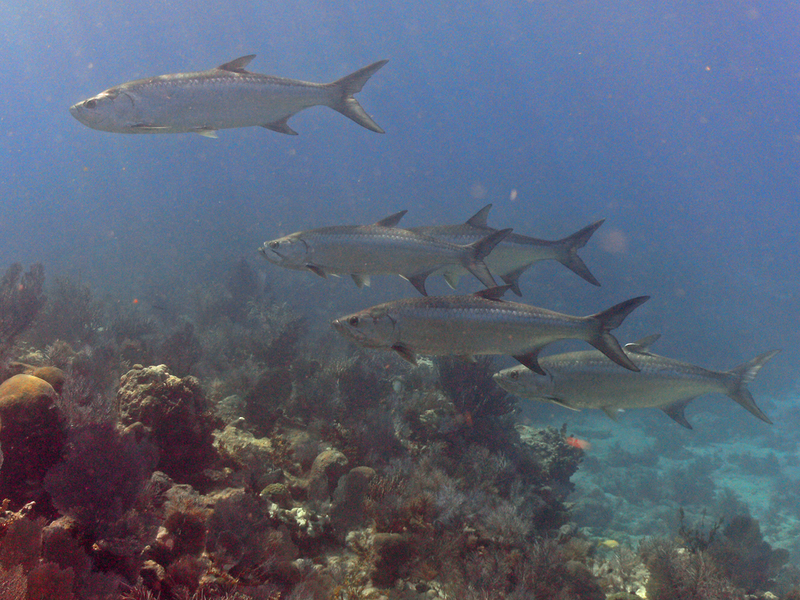 The big sighting of the day was a group of Tarpon. 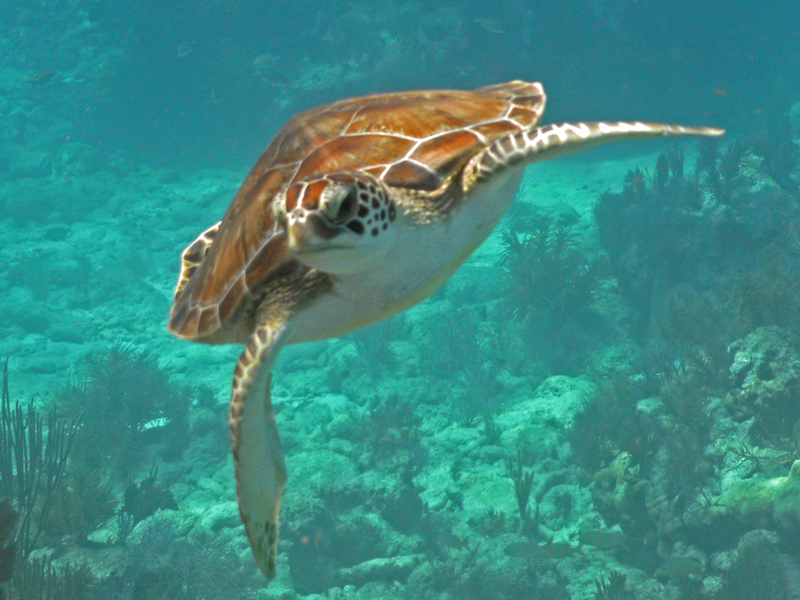 They were cruising the reef all day so I had several good photo opportunities with a few close-ups. 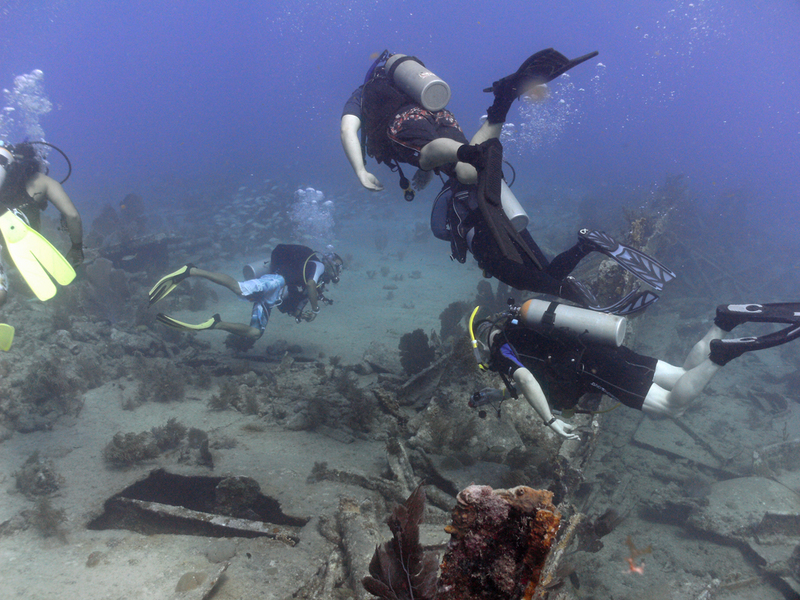 The Sunday morning dive was to the Wreck of the Benwood. The water was a rich blue and the visibility was fantastic! 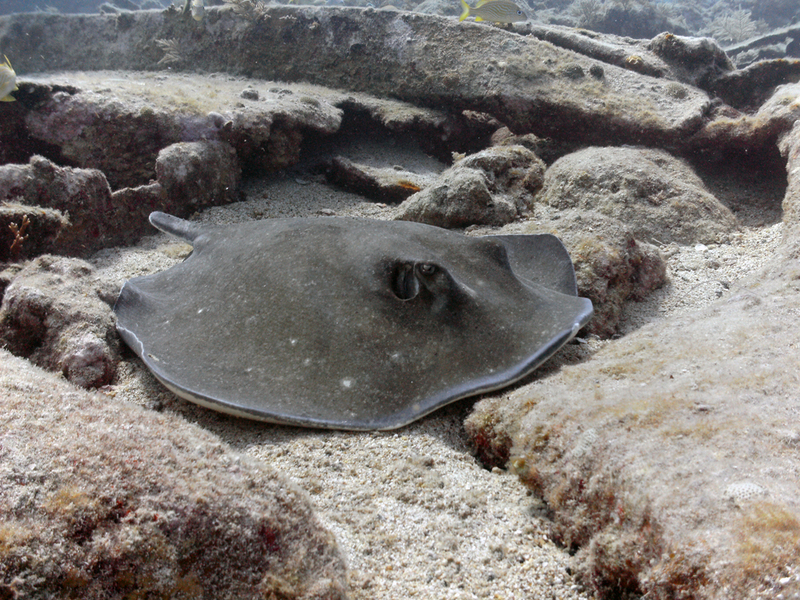 While making a circle around wreck I spotted a huge Southern Stingray, except this one had no tail (or stinger). One of my favorite tropical fish is the Yellowtail Damselfish because of its dark blue body speckled with light blue dots on the top half of its body. The juvenile Yellowtail Damselfish is even more striking becuase the whole body is dark blue and the light blue dots are even more pronounced. 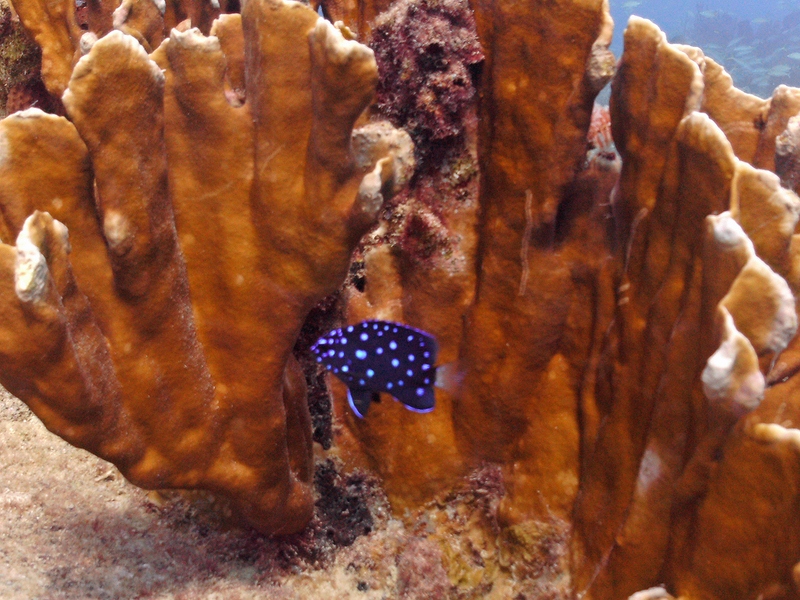 They are difficult to photograph but I happen to find one hanging around a piece of fire coral that I was able to photograph. 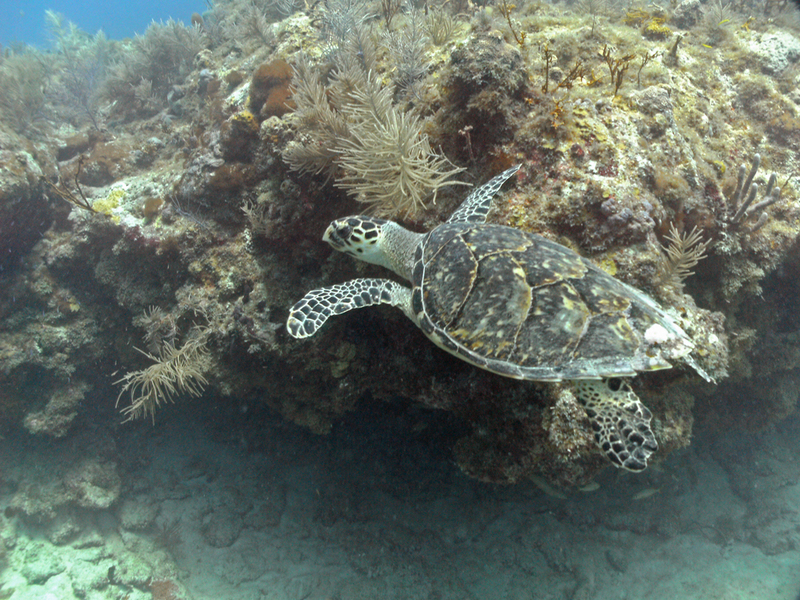 Another fantastic day diving in the waters off of Key Largo. We heard the current was very strong near Molasses reef so we went north to several dive sites in an area known as the Elbow. 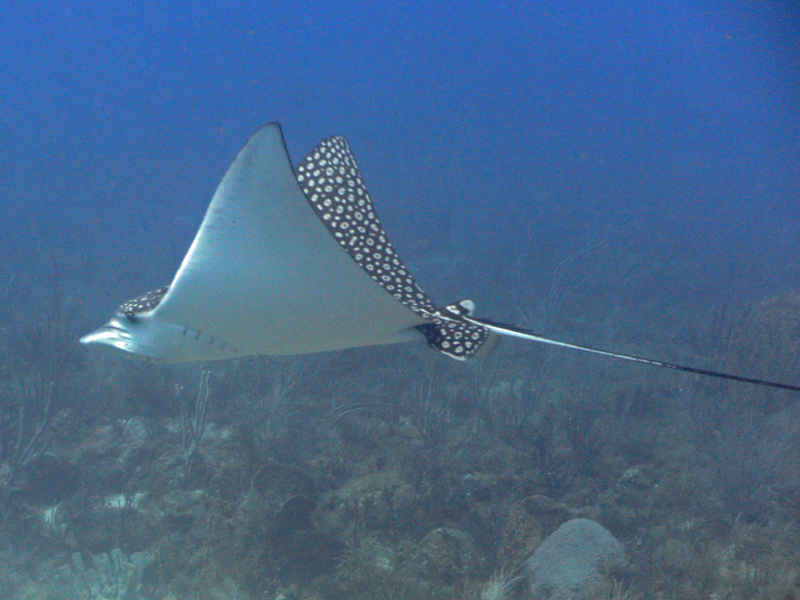 Our best marine life sightings happened at Banana Patch where I saw two Spotted Eagle Rays. 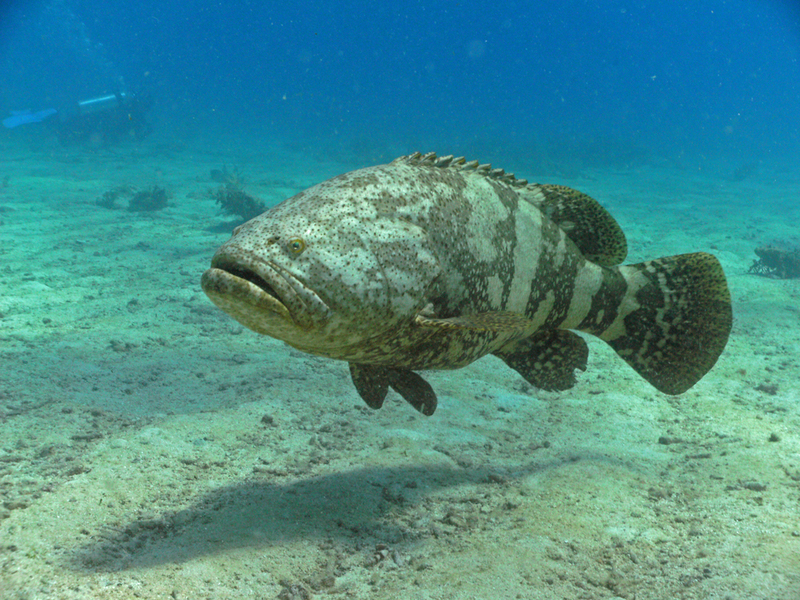 In addition to the Eagle Ray we spotted a Goliath Grouper hanging out near some old steel beams. 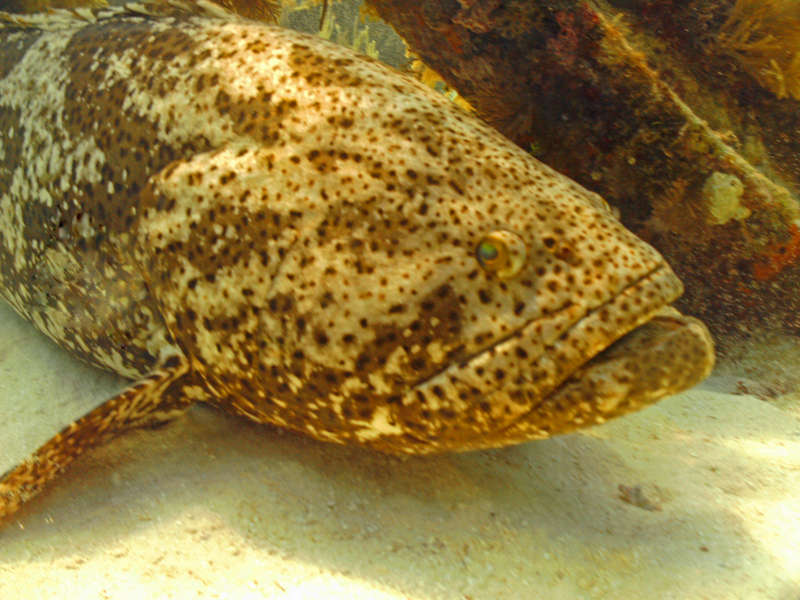 Luckily for me the grouper for not seem be bothered by divers and let me get a great close up shot.